I am beyond excited about this bread for three reasons: first, it is….. it is…. (drum roll)….. my own recipe!!!! Second, I am entering it in a “Bread Contest” launched by Jackie, from Pham Fatale. I hope you will have a moment to visit her site on October 1st to see all breads and vote for your favorite. Third, I am submitting it for this week’s Yeastspotting, my third contribution to Susan’s event. Of course, for the most part a “new recipe”, is an oxymoron, because almost all are variations on previous themes, and this bread is no exception. I played around with a basic sourdough formula that I’ve used countless times (from Hamelman’s Bread). It uses wild yeast as the sole leavening agent. I put my very own 1.5 year old starter to work (I call him Mr. Dan), together with white and spelt flour, plus caramelized onions and a small amount of goat cheese in the dough, to balance the sweetness of the onions. I can’t thank Jackie enough for this contest, that gave me a big push to create a bread recipe; I look forward to seeing all the entries. Caramelize the onions by sauteeing the slices in olive oil with the salt until they are dark golden. Sautee them slowly over low heat, stirring from time to time to prevent burning. It took me about 40 minutes. Don’t rush this process. Drain the onions of excess oil on a sieve, then cool them and cut into pieces. Refresh your starter two to three times over the previous couple of days to make sure it’s very active. Do the last refreshment 8 hours before making the dough. Add all the ingredients (except onions and cheese) to the bowl of an electric mixer and mix on first speed for 3 minutes. Check the hydration: if too sticky add a little more bread flour. Mix for 3 minutes more on second speed. Add the onions and cheese, and mix until incorporated. At this point, depending on the amount of moisture in your onions, you might have to correct the hydration. My dough needed almost 2 full tablespoons of flour. Remove the dough from the fridge and allow it to sit at room temperature for about 2 hours. Bake it at 430F for 45-50 minutes. A clay pot is perfect for this kind of bread. Place it in the cold oven, when the oven is ready, remove the lid (with oven mittens) and quickly dump the dough inside, make a couple of quick slashes, and close the lid. After 30 minutes, remove the cover to brown the crust. Internal temperature should be at least 200F. Place it on a rack to cool for 2 hours before slicing. (I know this isn’t easy, but it’s essential to avoid a gummy crumb). This is my favorite setup for baking this type of bread…. That bread turned out gorgeous! I would love it with soup. Such a pretty bread. I bet it tasted really great too! 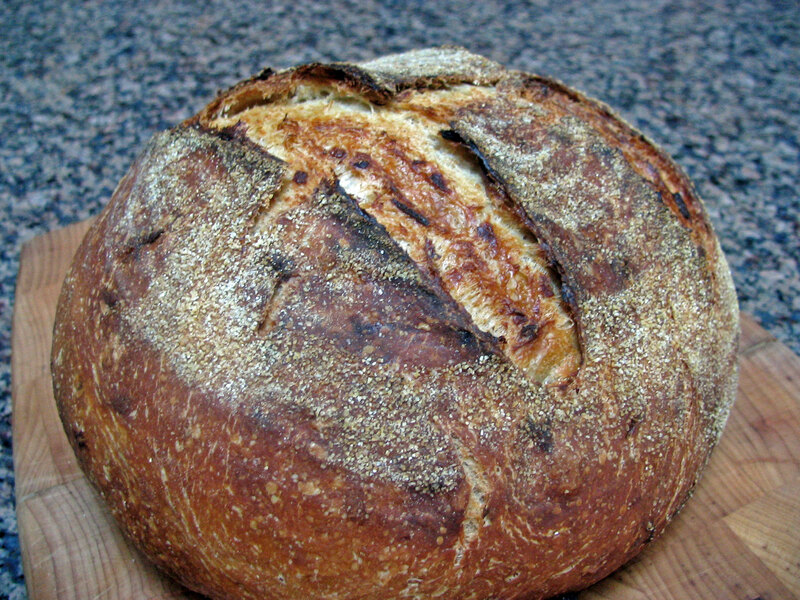 I love caramelized onions — and the photo of that sun-kissed proofing loaf. Thanks, Susan…. caramelized onions are so good! Roasted garlic comes as a close second…. Need to try this soon! I just doubled the recipe and have 2 beautiful loaves. Perfect recipe in every way. I found diced onions withstood the long browning process better than thinly sliced but other than that followed to the letter. Thank you! You just made my day!!!!! Awesome! Thanks for the feedback! I have 2 loaves on the go, only difference is that i had a nice swiss cheese. I will come back in the morning for the results, it looks great so far, love the carmelised onions! thanks for the feedback! Hope it’s a great bake!